As children grow, they need guidance and prayer support to develop maturely and spiritually. 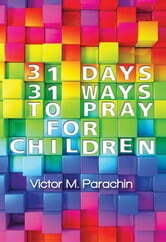 31 Days, 31 Ways to Pray for Children offers the perfect opportunity to give them love and support as they make daily decisions and face temptations and opportunities. Spanning the course of amonth, these prayers can be used day-to-day or on a special occasion...with a special dedication page for any child.